Heat oven to 350°F. Spray 5 (10-oz) individual baking dishes (ramekins) with cooking spray. Place on large cookie sheet with sides. Separate dough into 5 biscuits; cut each biscuit into quarters. Set aside. In 3-quart saucepan, stir gravy and cornstarch with wire whisk. Stir in chicken, vegetables, potatoes, milk, thyme and pepper. Heat to boiling over medium-high heat, stirring occasionally. Immediately divide hot chicken mixture among baking dishes; top each with 4 biscuit pieces. Bake 18 to 20 minutes or until golden brown. Carefully remove from oven. Sprinkle cheese evenly over tops of biscuits. Bake about 4 minutes longer or until cheese is melted. Sprinkle with bacon. Let stand 5 minutes before serving. 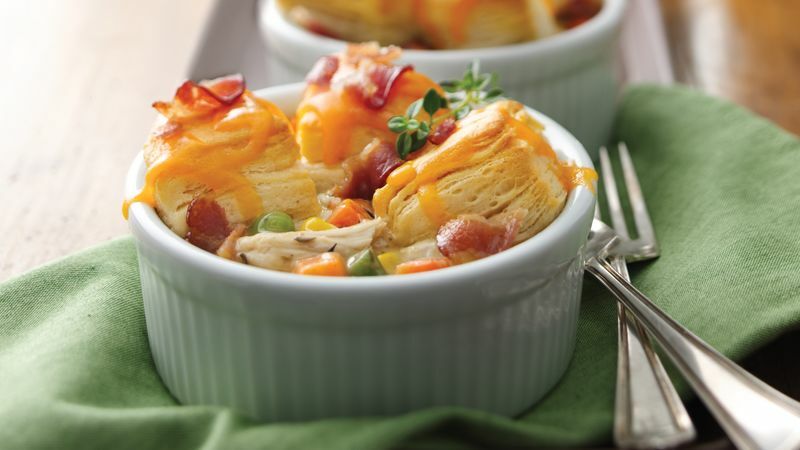 The chicken mixture must be piping-hot when spooned into the baking dishes in order to bake the biscuits properly.